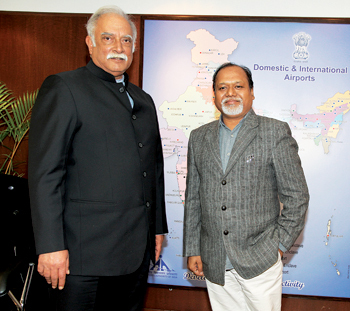 (Left to right) Anil Srivastava, Joint Secretary, Ministry of Civil Aviation, Goverment of India; Pratyush Kumar, President, Boeing India; M. Sathiyavathy, Director General, DGCA; Jyotsna Suri, Immediate Past President, FICCI; P. Ashok Gajapathi Raju, Minister for Civil Aviation, Goverment of India; Amitabh Kant, Secretary, DIPP, Goverment of India; Palash Roy Chowdhury, Country Manager - India, Pratt & Whitney at the launch of India Aviation 2016. The Ministry of Civil Aviation, Government of India and Federation of Indian Chamber of Commerce and Industry (FICCI) are jointly organising the ‘India Aviation Conference-2016’ on March 17, 2016, at Hyderabad. The theme of this year’s event is ‘India’s Civil Aviation Sector: Potential as Global Manufacturing & MRO Hub’. Canada is the ‘Partner Country’ for the biennial event this year. 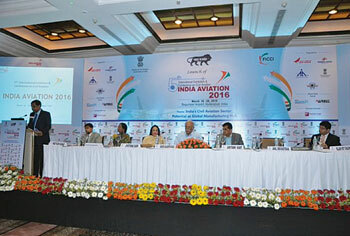 Launched in 2008, the ‘International Exhibition & Conference on Civil Aviation’ is a two-yearly event. 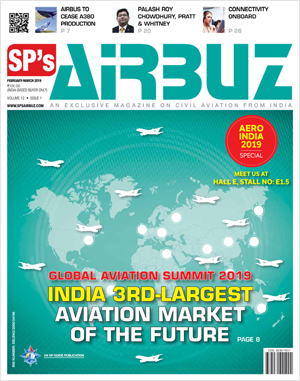 It has emerged as the largest platform for providing exciting opportunity for global players to tap immense opportunities in the fast growing Indian aviation market and for Indian players to interface with their global counterparts. The last four editions of India Aviation received tremendous response from international as well as national aviation stakeholders. This flagship aviation event is now firmly established as a key event on the international aerospace calendar, providing an excellent platform for developing business-to-business contacts. The ‘India Aviation Conference-2016’ provides an unmatched opportunity for the aviation players, all over the world, to debate on diverse topics relating to policy and regulatory regime, emerging challenges and opportunities, international best practices, etc. The conference brings together airport infrastructure developers/operators, airlines, bilateral and multilateral agencies, the leaders of major manufacturers, suppliers and technology providers in the aerospace industry to discuss manufacturing capabilities and processes, best practices, advances and innovations, automation, industry trends and forecasts. It will be a full day event with four business sessions addressing the opportunities and challenges in the Indian civil aviation sector. Business Session 1: ‘Manufacturing and MRO. Changing Global Scenario’. This session will discuss strategies for making India an attractive ‘Aerospace Manufacturing and MRO’ destination globally and highlight the key opportunities available to the international aviation players in the Indian market. It will also focus on identifying possible solutions for the technological and legislative challenges faced by the ‘Aerospace Manufacturing and MRO industry’ and developing the next-generation of workers to bridge the skill deficit in the aerospace industry. This session will identify the infrastructure, aircrafts and technology requirements for the sustainable growth of air transport industry; discuss the impact of multi modal and inter nodal transportation system on the development and growth of airports; highlight the role of modern technologies in the areas of aircraft operations, air traffic management systems, etc. This session will discuss issues relating to air cargo supply chain and overcoming restrictions preventing the air cargo industry from reaching its potential; modernising air cargo to improve cost-effectiveness and efficiency, etc. This session will also derive lessons and best practices from successful air cargo hubs around the world. 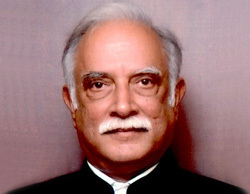 This session would highlight the innovative financial techniques and methodologies to meet the growing financing needs; strategies for making Indian civil aviation sector an attractive investment destination; identifying possible solutions to challenges – high taxation regime and surveillance related issues, skill deficit, etc. – to ensure viability of the sector, etc. The conference promises to address the key challenges confronting the sector and promote an open dialogue among industry thought-leaders to innovate practical, sustainable solutions to boost growth of civil aviation in India. This year it would highlight the emerging investment opportunities in the Indian aerospace manufacturing market and building capabilities for promoting indigenisation of aerospace manufacturing and MRO services.